They found the graves of 26 local men who died in WWII and wanted to know more. That became the seed of a project that would span the next two years and involve 72 student researchers. 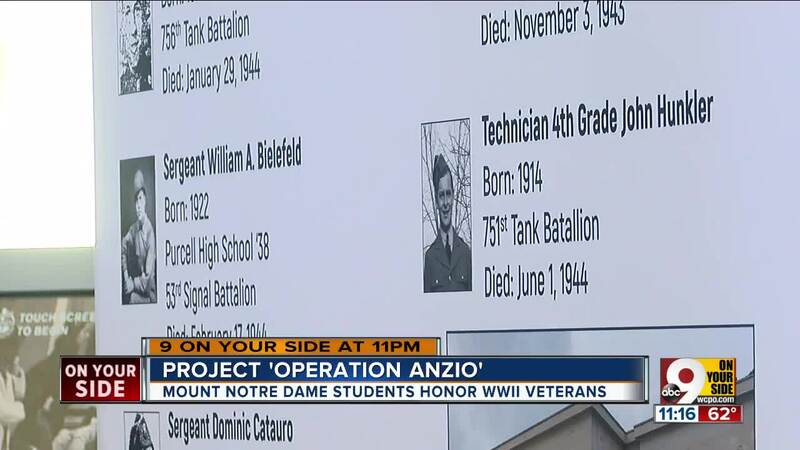 CINCINNATI — Assistant principal Ben Hunt intended it as a short-term assignment for a team of Model United Nations students on their way to Rome: Find the graves of the local men who had died in World War II and been buried in Italy. That question became the seed of a project that would span the next two years and involve 72 student researchers, who collaborated to create the full-scale museum-style display that opened Tuesday in the school foyer. The exhibit includes information about each of the men, some of whom were as young as 22 when they died, the war and the six-month battle that claimed many of their lives. The Allies lost 7,000 men to the Battle of Anzio between Jan. 22 and June 5, 1944, one of many salvos in the fight to reclaim fascist-held Italy from the Axis powers. Lakatos, who helped her classmates contact the men’s families over the course of the project, said she hopes it gives them a more personal look at the conflict. The exhibit will remain at Mount Notre Dame until summer, at which point it will move to the Tri-State Warbird Museum. It will travel to Purcell Marian High School for the fall. “Seeing these kids realize these are real people, researching, finding their stories, they’re helping bring their stories alive,” Hunt said.